This is a beautiful autumn dish. It works best with autumn squash, although butternut can be used but it gives a slightly sweeter flavour. The goats cheese is optional for those who don’t like it. and season, then roast for approx 30 minutes until tender. Meanwhile, make the tomato sauce. uncovered, for 30 mins. Stir from time to time. seasoning if required. Pour into a bowl and set aside to cool. seasoning and a good grating of nutmeg. Wipe out the spinach pan and melt the butter over a low heat. from the heat and gradually add the milk, whisking continuously. sauce is thickened. Stir through the mustard and set aside. and 3 layers of lasagne in total. Butter a large gratin or baking dish. gently with a fork to spread it out. 2. Pour over half the tomato sauce. 3. Top with 3 lasagne sheets. spinach and half the goats cheese. 5. Add another 3 lasagne sheets. 6. Spread the remaining squash on the top. 7. Now add the last of the tomato sauce. 8. Put the final layer of lasagne in the dish. 9. 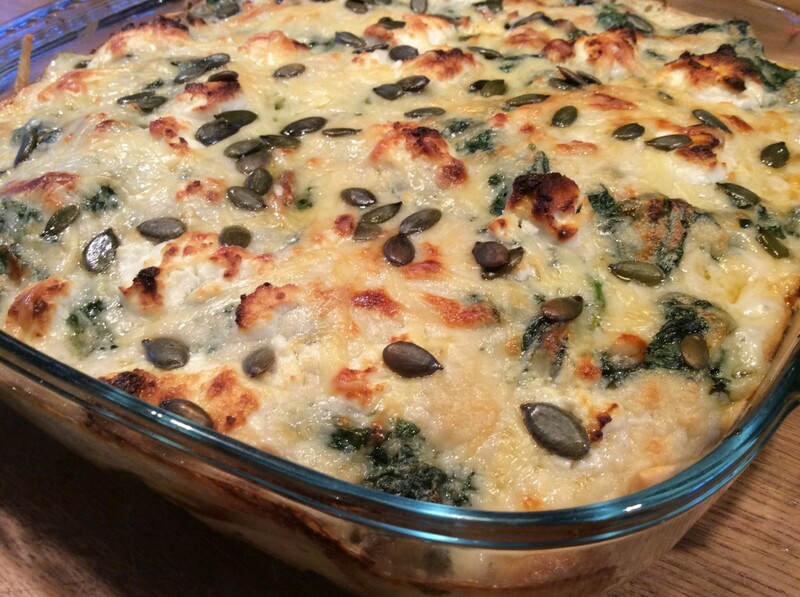 Scatter over the remaining spinach and goats cheese. cover the top of the dish. and scatter over a handful of pumpkin seeds.